The Association of Dairy Farmers of Canada now have 2 CoBies that they are touring Canada with to promote healthy living, and specifically maintaining a healthy weight. 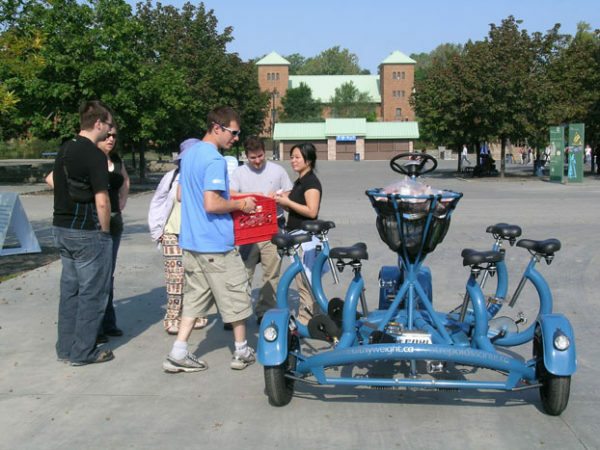 Gilles Deschenes, director of the program writes: We used two Conference Bikes in 2006 to promote our Nutrition messages for dairy products here in Canada. Dairy Farmers of Canada promotes dairy products generically, like the “Got Milk” promotion does in the U.S. so these 7 seater bikes were perfect for us to attract media and consumer attention across 8 of the major cities across Canada during a month tour. 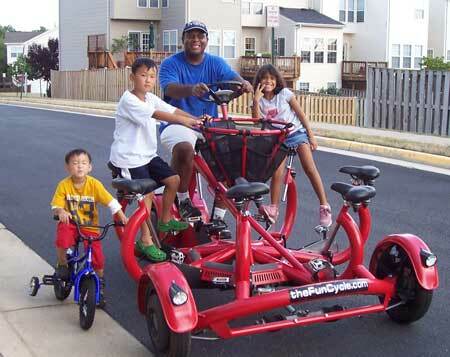 They are very well built and easy to maneuver for 1 person, while the others assist by pedaling. We arranged the middle basket where people put their hands to hold on, with a plastic liner so that we could put ice and dairy products like milk, chocolate milk and yogurt for the consumers to enjoy while doing a little exercise. We were present at many events and we got media coverage in many markets. 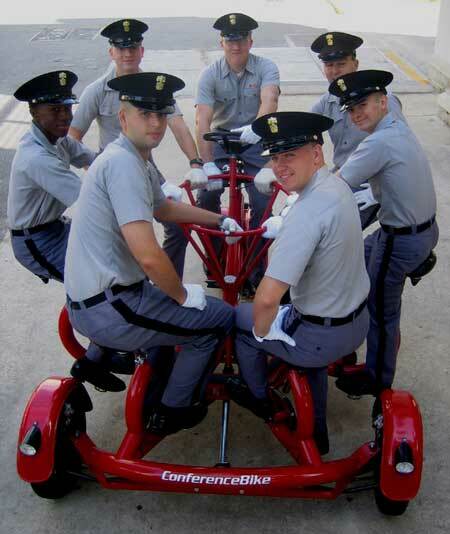 Overall a great campaign, using a great unique bicycle as an attention grabber to promote physical fitness and healthy eating habits. 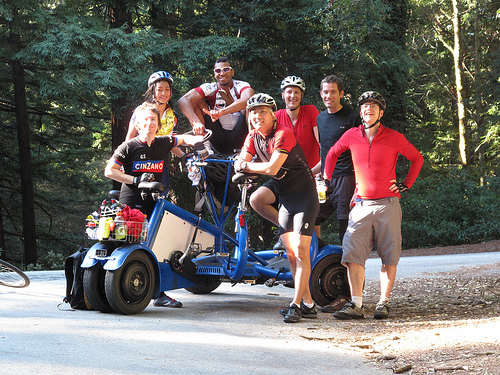 Alternative energy advocate Meg O’Shaughnessy was wintering in San Francisco when she had her first CoBi ride. “This is more fun than the proverbial barrel of monkeys!! 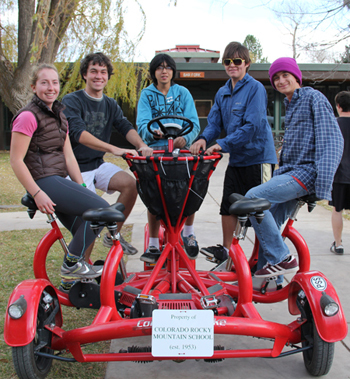 I need to have one of these for my town.” At Colorado Rocky Mountain School the main reason for using the bike is to generate enthusiasm for alternative modes of transportation and capture people’s imaginations about the overall advantage and enjoyment of riding bikes. 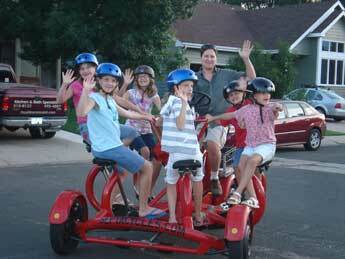 It is also a great tool for reminding other roadway users to “Share the Road,” lighten up, and enjoy the journey. 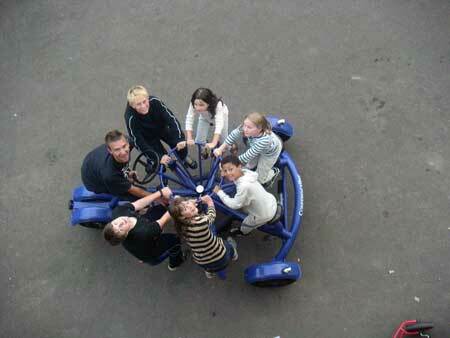 CRMS Students pedal around on the Combined Energy Vehicle (as the CoBi has been renamed) as part of sports training. On the CRMS campus, the C.E.V. has sparked great enthusiasm from the students and community. 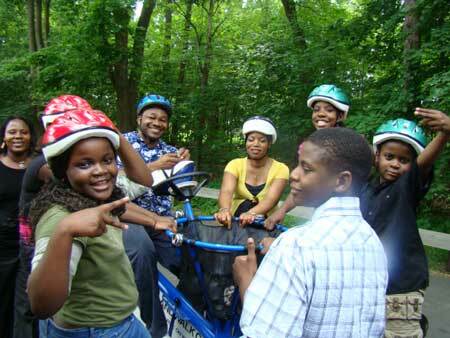 Outdoor Program Director Darryl Fuller writes, “The students love it. 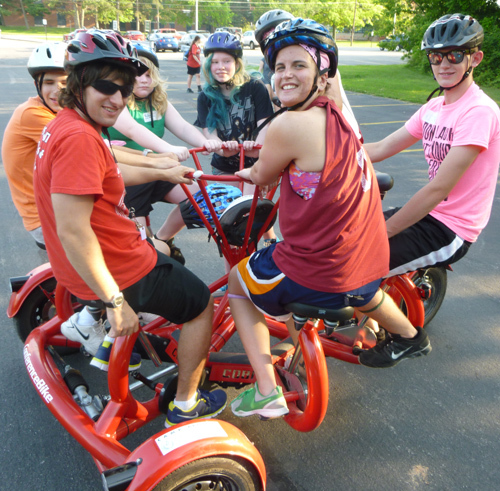 They are fascinated and excited whenever they get a chance to ride on it.” Any CRMS group with an authorized adult driver can reserve and use the bike. 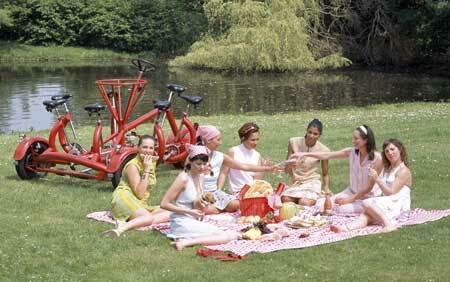 When the bike is ridden to town, people are also just as fascinated, Fuller comments. “Cars stop in the middle of the road to gawk or ask questions. Almost everyone smiles. I haven’t yet noticed any annoyance or impatience from cars that are invariably held up by its slow progress (something you often can’t say when riding a regular two-wheeled bicycle).” The bike now belongs to CRMS on a full-time basis with the guidelines that O’Shaughnessy can borrow it for her sustainability events. As part of this donation, CRMS is also discussing how they are going to use the bike in town events, such as Bonedale Bike Week, and for general town-related bicycle advocacy. WINNERS! 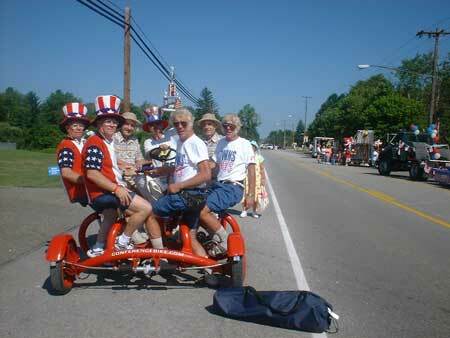 The CoBi was the winning float in the annual Twinsburg, Ohio parade of twins. The 97-year-old Chiavetta twins are the oldest CoBi riders on record. 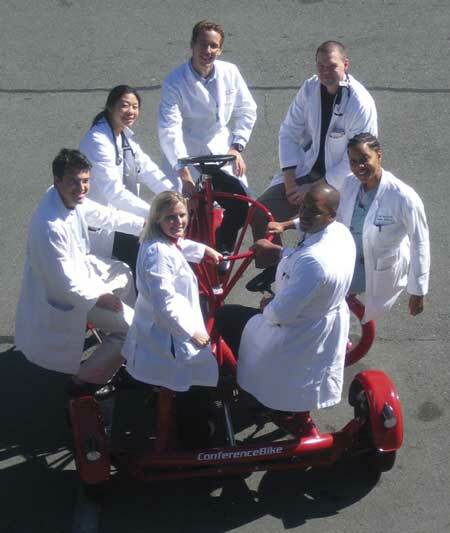 In addition to the obvious benefit of exercise, the CoBi allows our students to be active participants in an activity in which they would usually be passively involved if at all – riding a bike. 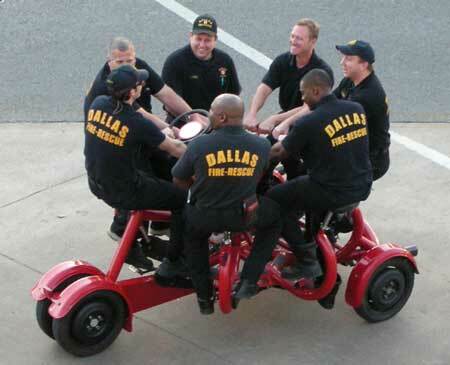 It empowers the person who is deaf-blind to participate in an activity where teamwork is needed. 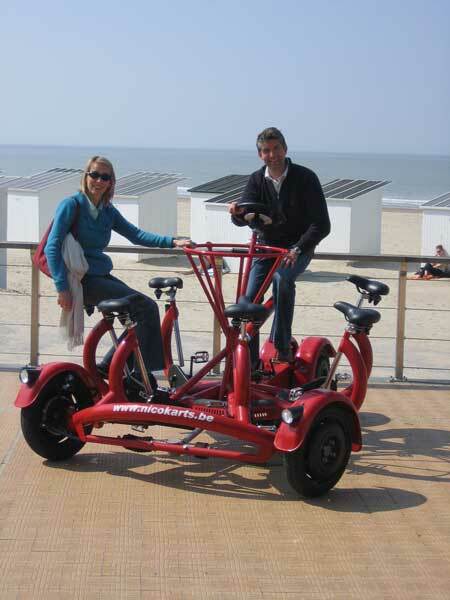 It promotes socialization and accessibility to communication which would otherwise be unavailable during a ride on a bike. Helen Keller National Center, Sands Point, NY. “Thanks for making this possible through your genius and artistic mind. 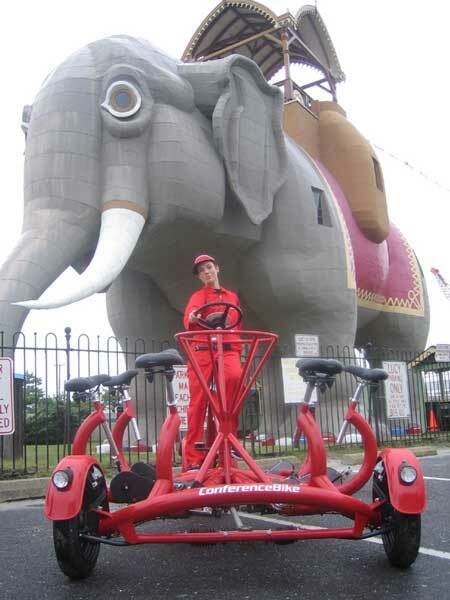 My entire family and I are humbled to be able to market your invention.” BIKE AND WALK YOUR HEALTH UP, LLC is pleased to introduce the CONFERENCE BIKE or COBI-7 in HAMPTON BEACH NH, WORCESTER COUNTY and in CAPE COD. 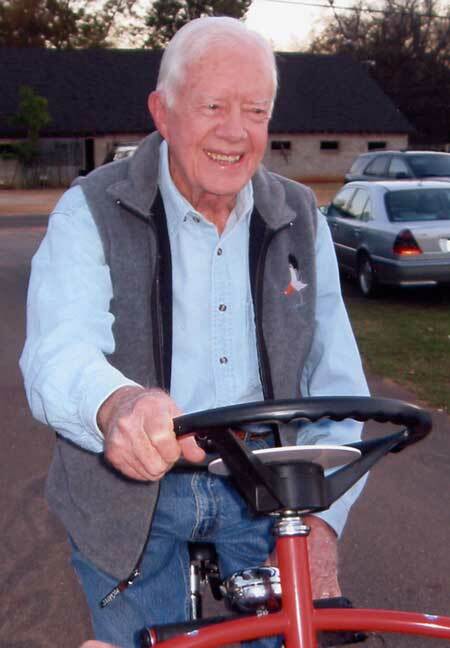 The ConferenceBike is a blast. After the first season of renting and giving rides on my ConferenceBike, I feel very fortunate to have stumbled upon this awesome invention. 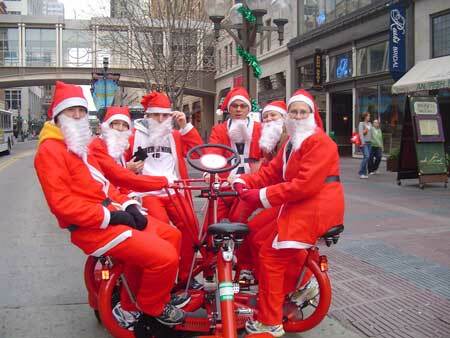 My company Septacycles.com rentsConferenceBikes in Fort Collins, Colorado for parties, parades, and tours. 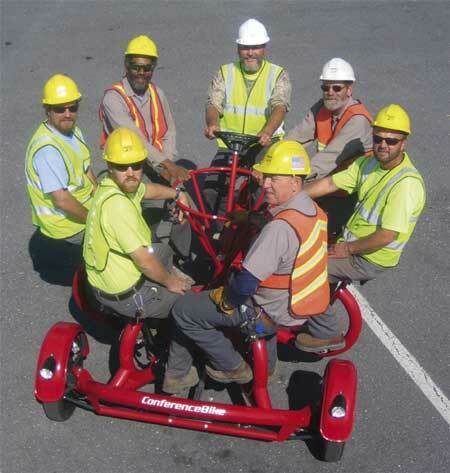 We rode theConferenceBike in the world largest bike parade, the New Belgium Brewery’s Tour De Fat. 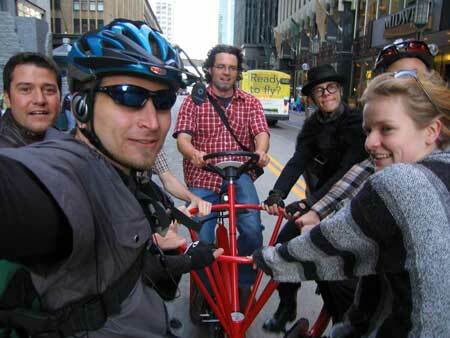 My favorite thing has been seeing families, friends, co-workers, and strangers all enjoying the ConferenceBike experience. 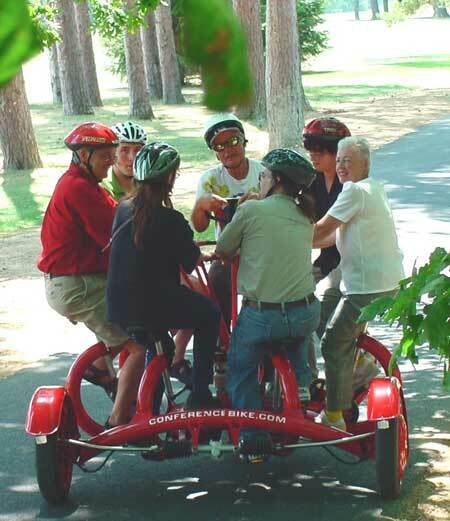 There aren’t that many activities that everyone will enjoy but the ConferenceBike never fails to get everyone laughing, smiling, and having fun. “Here in Pennsylvania (home of Mack Truck), if something is built very well we say it is built like a Mack. In my opinion the Conference Bike is built like a Mack Truck. The Conference Bike is a work to be amazed at by anyone. Some of the work I have done has included work with the visually impaired. 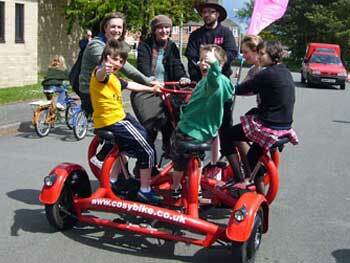 At times I have had six visually impaired people riding with me on the Conference Bike. I had the unique perspective of being able to observe their facial expressions. 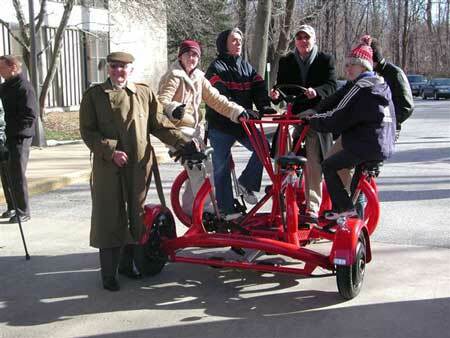 Of course the ConferenceBike is novel and people are amused and curious even at first glance. That novelty is enhanced when the riders begin to pedal as they realize it’s really true, this curious device actually takes off under their own power. But that is not all there is to it. I have piloted the CoBi many times. The core of the CoBi and what makes it an important work of art is the unique social environment it creates owing to Eric Staller’s creative insight. The result is a resonating experience that delights me again and again.